Most dryland pasture systems for sheep and beef cattle in South West Victoria are based on summer dormant cultivars of perennial ryegrass or phalaris with subterranean clover (Sargeant 2008). Perennial ryegrass has a number of advantages including ease of management, herbage of high nutritive value and an ability to tolerate a range of grazing practices. However, perennial ryegrass also has a number of disadvantages including a shallow root system, spring dominant growth pattern, low summer productivity and often poor persistence – particularly in hot and dry summers. 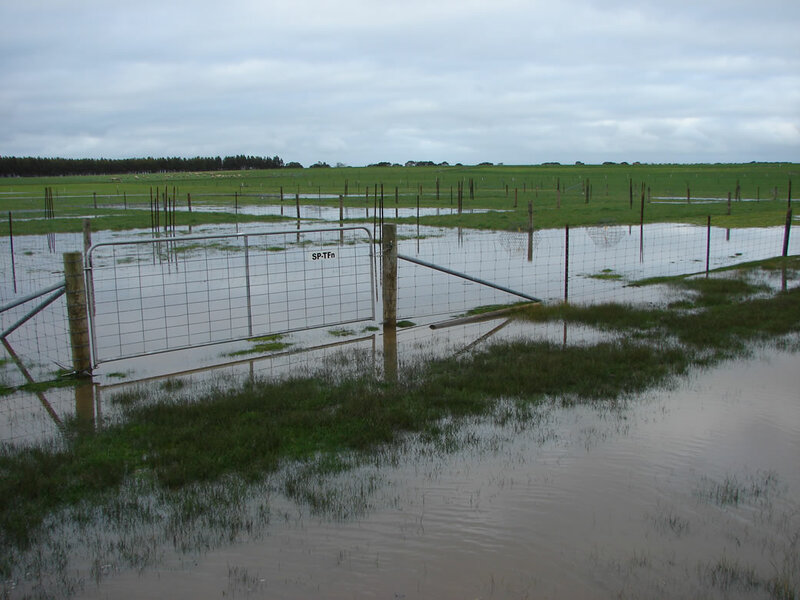 Phalaris has deeper roots and is therefore more persistent but is used less as rainfall increases towards the coast. In these areas perennial ryegrass is easier to establish, gets away faster in autumn and is easier to maintain feed quality in spring. The old cultivars of perennial ryegrass and phalaris (eg: Victorian and Australian) are not as productive as the newer cultivars but continue to be sown as they are considered forgiving in terms of grazing and establishment. 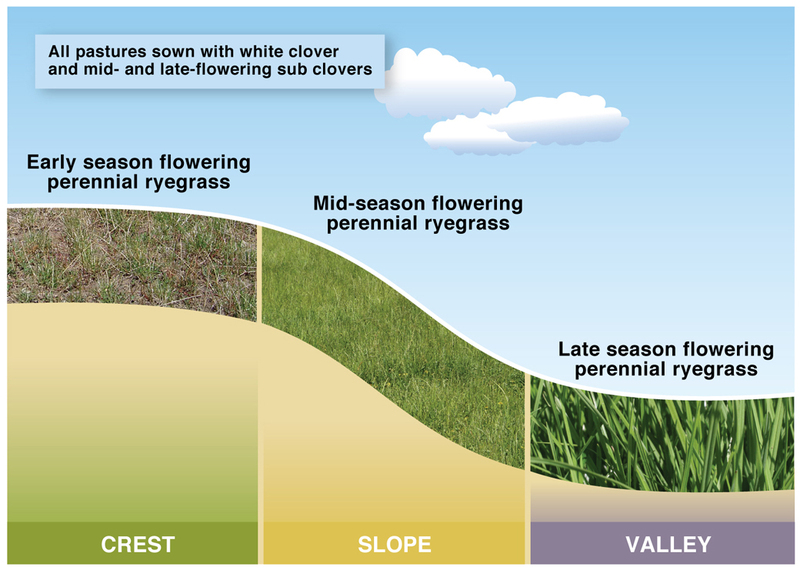 Newer varieties of perennial ryegrass allow farmers to select for longer or shorter growing seasons depending on where the pasture is to be sown – on well drained crests or valley floors which hold moisture for longer (Figure 1). Newer varieties of perennial ryegrass also allow farmers to select for novel endophytes (fungus which live in symbiosis with the plant) which increase persistence of the plant while reducing the incidence of perennial ryegrass staggers and associated animal health issues. Current research on endophytes is underway at the Dairy Futures CRC. Summer dormant tall fescue is starting to be used in place of perennial ryegrass in drier areas, in place of phalaris in acid soils, or to avoid staggers and toxicity issues with these species. However, feed quality of tall fescues can be difficult to maintain in spring. Figure 1. Early, mid and late flowering perennial ryegrass used for the crest, slope and valley at Hamilton EverGraze Proof Site. Pasture systems based entirely on summer dormant species such as phalaris and perennial ryegrass create challenges for meeting livestock requirements. They play an important role for long-term persistence and winter and spring production, but generally lack summer activity which can restrict options for finishing stock in late spring and summer, and creates a heavy reliance on supplementary feed over the summer-autumn period. This was shown in the Hamilton EverGraze Proof Site experiment. Deep rooted summer active perennials such as lucerne, chicory and summer active tall fescue are starting to be used more to make use of out-of-season rainfall which is on average around 110mm, but can be up to 300mm. 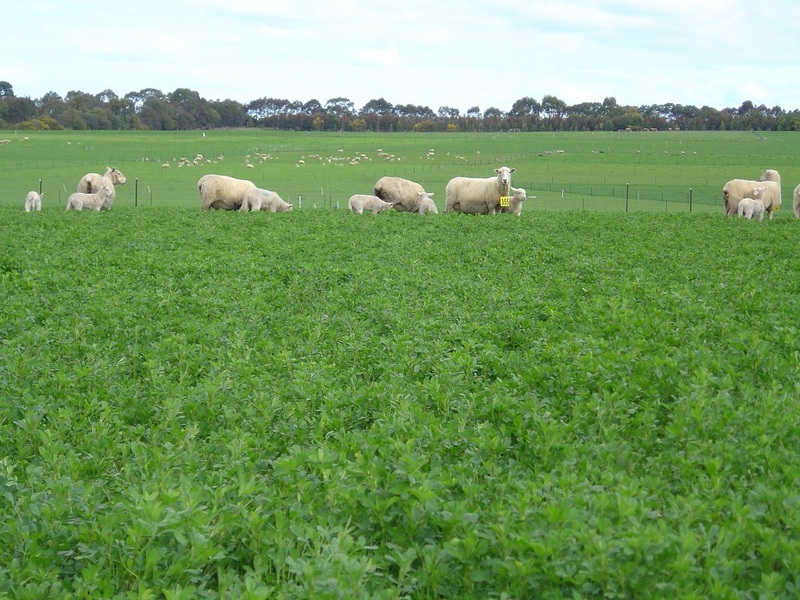 The areas suitable for lucerne are restricted to well-drained crests and low sub-soil acidity. Summer active tall fescue is particularly useful in poorly drained valleys. Chicory can provide an alternative to lucerne in acid soils but has been found to be less persistent. Summer active cocksfoots are a component of pastures in a high proportion of farms, but are less commonly sown now due to a lower winter production compared to phalaris and perennial ryegrass, and lower tolerance to drought and waterlogging in the region (Sargeant 2008). Clovers provide an important component of pastures for fixing nitrogen as well as providing a high quality feed source. Subterranean clover is the most commonly used legume in the south-west, especially in the drier parts of the region. White clover is also commonly used in dairy pastures close to the coast, although it doesn’t tend to persist as well as Subterranean clover through summers in the drier parts of the region (see Hamilton Proof Site). Information on selection of legumes can be found in the EverGraze Exchange – Legumes for temperate pastures. There has been an expansion of annual cropping systems, particularly in the northern part of the region. The lack of perennials in these systems creates issues around ground cover targets and salinity. Set stocking is still the most commonly used practice for beef and sheep producers in the region, with around 40% of farmers indicating they move stock between more than one paddock (Sargeant 2008). Rotational grazing is used by more beef producers than sheep producers. There is significant opportunity for improvement to pasture utilisation and persistence of pastures with implementation of improved grazing management. 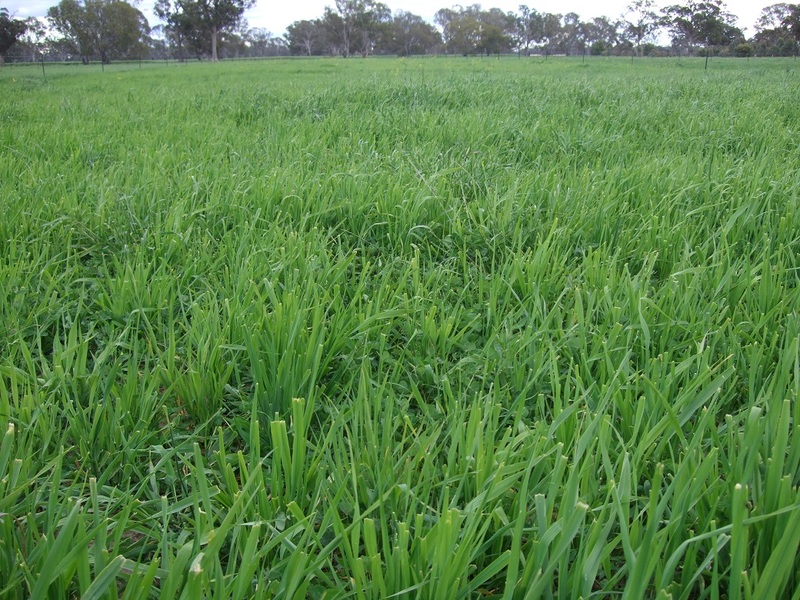 Growth rates of perennial pastures in the region vary with pasture species, soil type and rainfall. The maximum, minimum and average pasture growth rates of a range of perennials was measured at the EverGraze Proof Site in Hamilton. Further information on pasture growth rates for the region can be found in the Regional Pasture Growth Rates. Diversifying pasture species, including use of summer active perennials and putting the right plant in the right part of the landscape to increase persistence, manage ground cover, address animal health issues (eg. ryegrass staggers) and better distribute feed supply and demand. Addressing winter waterlogging including selecting appropriate species and use of surface drainage.